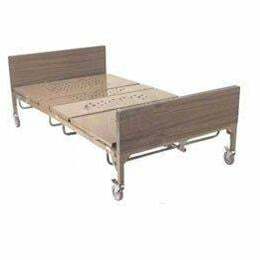 The BAR750 Bariatric Bed is a heavy-duty full-electric bed frame capable of supporting up to 750 pounds. The bed expands from 39" wide to a full 48" and from 80" in length to 88". Four ultra quiet DC actuators easily reposition the head and foot sections, as well as the bed height. Battery back-up, bed ends and half rail standard. *Please remember this catalogue is for informational purposes only. If a product appears on this website, it does not necessarily mean that we have this product in stock. Please call one of our customer service reps to find out if this particular item is in stock at 972-647-0111.